Bloco Do Sul play samba, a music that evolved in Brasil with the meeting of African Yoruban slaves and the native South American Indians, and is a long way from the TV 'Come Dancing' kind of samba. Bloco Do Sul play samba, a music that evolved in Brasil with the meeting of African Yoruban slaves and the native South American Indians, and is a long way from the TV ‘Come Dancing’ kind of samba. 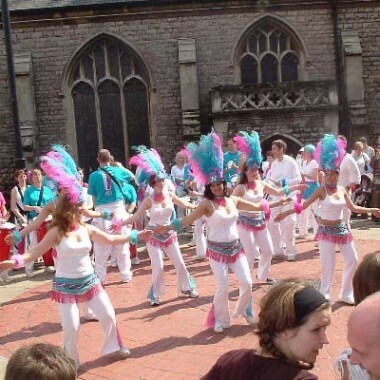 In recent years there has been a growth of samba schools throughout the UK. Most cities now have one. They are modelled on the ‘Escolas de Samba’ from Rio de Janeiro, where preparations go on all year round for the Rio Carnival in March. Huge floats are constructed for this event with many hundreds of people participating in each Escola. Traditionally each Escola has several sections, one of which is the Bateria (drummers). 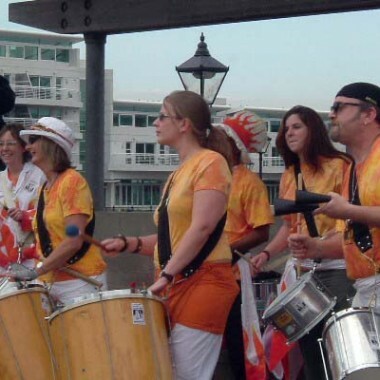 The term school of samba cannot really be applied to many of the UK groups, they are better defined as blocs or blocos, meaning groups. 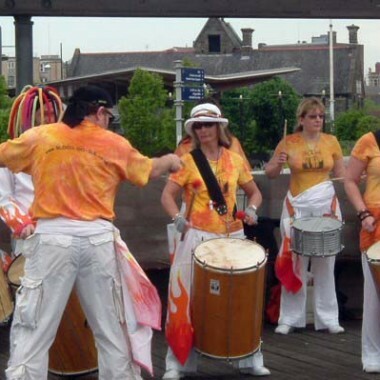 A samba bloco will often consist of the bateria alone. In addition to playing batucadas from Rio, we play other samba rhythms from Brasil such as maracatu, samba reggae and foxe. 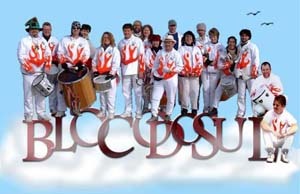 Bloco Do Sul have been in existence for over 21 years and are the oldest bloco in the UK. We are based in Surrey in the UK and have played many gigs in and around the county. Recently we have been lucky enough to have been accompanied by a modern and contemporary dance group named HYPE – ‘Happy Young People Entertaining’. Surdo Long bass drums ranging from 14″ to 24″ in diameter. Repenique Small deep drum with no snare. Played with one hand and one stick. Tamborim 6″ hand held shallow drum. Timbe A conical hand played drum. Agogo Twin, triple or quad bells.